After two weeks of walking, I’m slow to get my arms around what it is that appears right before my eyes. Blink and you miss a castle. Look to the left and you pass by on the right a church razed by the Moors only to be re-raised by Christian’s in the 1,200s. Toto, we’re not in North Carolina anymore. It is some combination of urban and rural, agrarian and ancient, Christian and invader. We have trod from lush, forested hills in the far north to mostly – but not always – flatlands, marked by mile after mile of vineyards and wheat and sunflower fields in seemingly infertile and impossibly rocky terrain. But somehow the Spanish have made the land work for – what? – more than 1,000 years or longer. 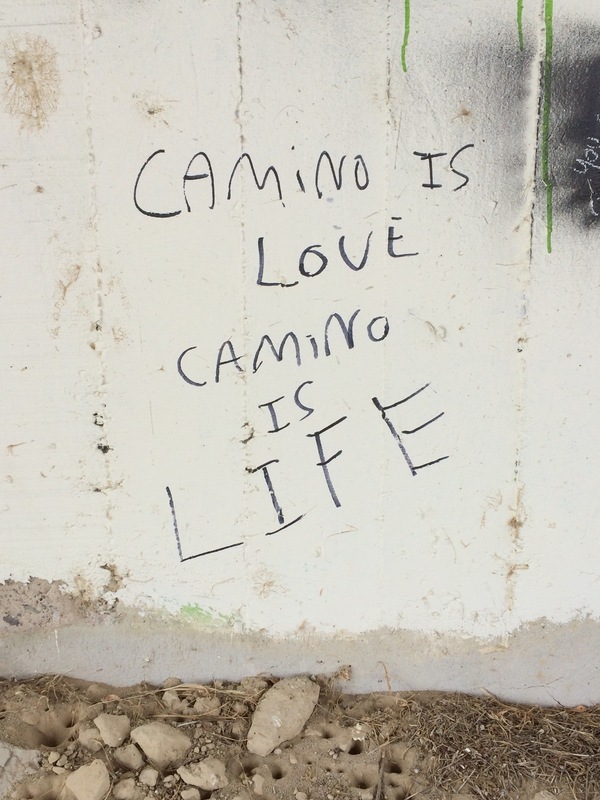 It is beautiful – every mile of the Camino. (Even if my photos can’t begin to adequately capture what the eye can see.) Part of each vista is based on knowing, you know, that all those years ago, Romans trod the very rocks you navigate today. Those ruins over there? A hospital for ailing pilgrims. That fortress in the distance? Possibly used by legendary national hero El Cid to fend off enemies. And the still-standing church? Likely rebuilt atop a church demolished by one religion at the expense of another. I keep telling myself to ‘Look up, Dave, look up’ because if you don’t what you miss is your loss. Some may see the barren hillsides and arid valleys as just that – barren and arid. But this land, this brown dirt, is coated in history. Roman legions and Muslim invaders and later Spanish patriots. They’ve all been here. Even the earliest Europeans – Cro-Magnons and his/her forbears – were here. And now we’re here, too. Plodding along in modern gear, following in their footsteps, hoping for a glimpse (if in spirit only) of what brought them to Spain and to faith. 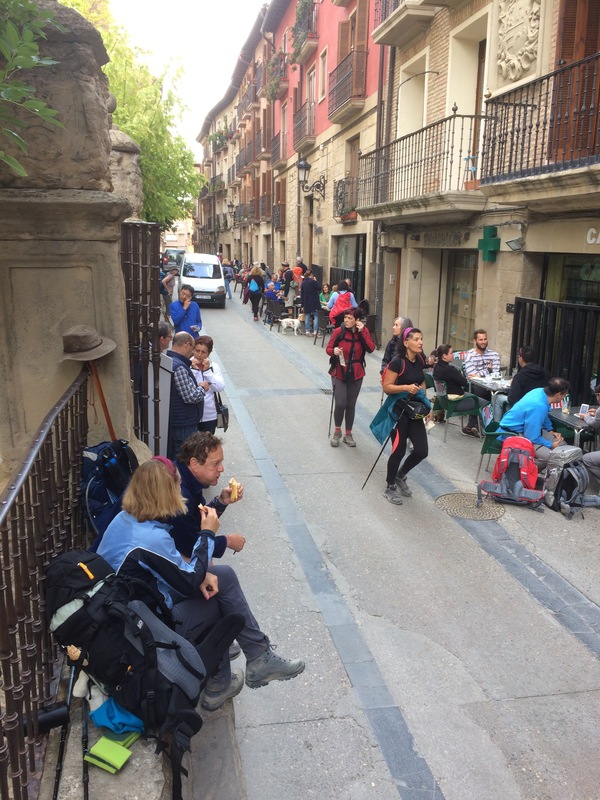 The Camino brings peregrinos to the path, the way, and now it’s up to us to finish the journey others started so long ago in a country that is mysterious and in a way foreboding yet so very, very real. My buddies who hike with me in Wyoming – Katy, Vince, Tom and Richard, et al – are all too familiar with false summits. It’s a phenomenon where, as you climb uphill, you think you see the blessed crest of the trail as you say to yourself, in hopeful relief, “I’m almost there.” Almost as in not quite. Almost as in ‘nice try.’ And in most cases the true summit is not even close. It’s a soul crushing feeling to know you have hundreds of yards – or a mile – to go. Experienced walkers know not to drop their guard until they are finally at the real and final top. Today was one of those days I fear the most; seemingly every one of the 31 kilometers from Burgos to Hontanas was a grade or uphill or a slope with a crest that would not reveal itself to me. Of course they weren’t. It just felt that way. Fatigue and heat have a way of piling despair atop the shoulders (and feet) of weary peregrinos. It just exacerbates the discomfort. It’s as if the first festive week of ‘l’m here!’ euphoria has dissolved into blisters and achy muscles and Compede and wraps and balms. Not that tempers flare but patience can be tested. So with the finish line nearing (but not in sight) a sign read “5k y Hontanas.” Great. A marker I can live with. And on I went. Uphill. About 6-7 minutes later, and trudging up another slope, I was startled by a nearly identical sign: “5k Hontanas.” Geez guys, I thought of Camino caretakers, get your stories straight. It was soon thereafter I fell prey to my own false summit demons. Around a corner and partially hidden by a tree, I thought for certain the crest was at hand and that surely the catedral spires and low slung casas of the tiny, ancient town would at last sweep into view. But no. No sooner had I rounded the curve then I saw the accursed truth; at least another half kilometer of gradual slope, the true top concealed. And on it went, one false crest after another. Every step was a crushing disappointment. As for the original “5k” assurance it was a total falsehood – it shortchanged Hontanas by 3-4 kilometers – that evaporated in the dusty, arid wind. Eventually, and after much cursing, I came upon the town, found a bunk, showered, did my laundry, dunked my barking dogs in a pan of water and found a restaurant. My answer to question #1 was about food and you can guess my answer to question 2: it involved a cold glass. Photos can’t come close to giving the Spanish landscape a shard of due justice. What’s hard to fathom is that in my 10 days of walking (10 days? Really?) 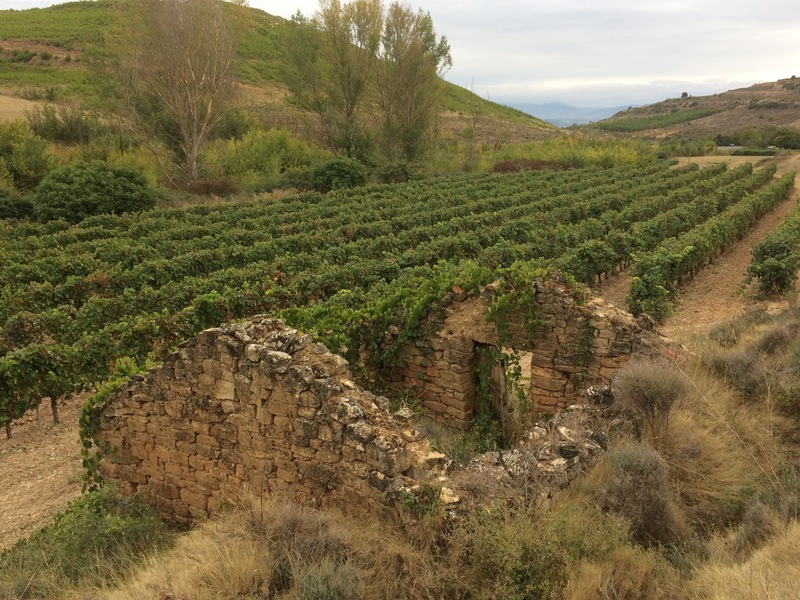 and roughly 160’miles that a landscape can change so dramatically from the lush, steep sheep manicured hills of the Pyrenees to the semi-arid valleys and mesa-like geography ideal for wine and wheat. And in the midst of it all are hamlets born in medieval times (if not earlier) that have scarcely more inhabitants now than when local red limestone was mined 1,000 years ago for Iglesias, fortifications and homes. But Espana has been inhabited for much longer. Today I wobbled through Atapuerca, a small town of 250 where remains of hominids were unearthed about 45 years ago and threw the world scientific world into a tizzy. Seems our early ancestors roamed the nearby hillsides to hunt and butcher bison, bears and other beasts 850,000 years ago. I’ll get into Spanish agriculture later but suffice to say wine (vino tinto and vino blanco) is grown on ancient vines as big around as your thigh. That’s old. Real old. It’s little wonder Camino hikers gorge themselves on pan (bread); wheat is grown anywhere and everywhere. My right hand has become a mini-thresher. I retrieve the business end of the wheat plant on the edge of recently picked fields and roll it in my clenched fist until literally the wheat separates from the chaff. The residue is in my cupped hands and, with a few good Big-Bad-Wolf blows, the chaff is gone. It makes for something crunchy when you have nothing else to do but put one foot in front of the other – as you’re thinking about who lived here and when. 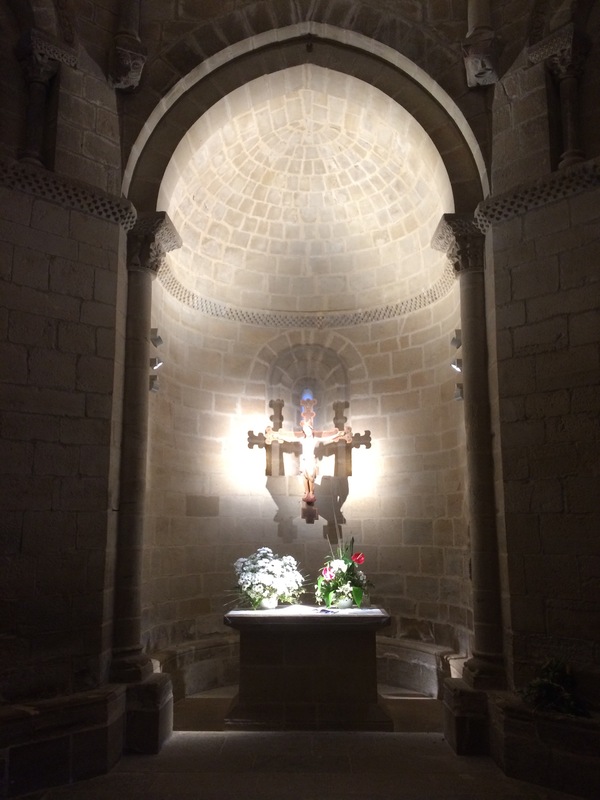 Camino de Santiago 9-25-17: A minority of one when the real question is: Que? Warum? Pourquoi? Why? It’s the question everyone asks. It bisects language and cultural barriers. In no way is it rhetorical; the asker nearly demands an answer from the peregrino. Any pilgrim in their right mind ought to expect it and most have walked in enough reflective solitude to form a considered answer. Why do you do this? Why endure the pain? Why? It’s not altogether a simple, off-the-cuff response. Nor should it be. Just a bit ago, an Aussie and I asked a German woman, Uta, over a beer, ‘Why?’ It seems a year ago her husband jilted her for another woman. In tears, she related how she’s now saddled with a house and two children, and a demanding job. The six weeks of introspection and reflection, Uta said, was for her. Not friends, not others. Her. Kirsty, the middle aged Australian, recently quit her job – she described her manager as a ditz – and although she denied a spiritual side, she too is looking for resolution to internal conflicts. Then there’s Steve, a lanky retired flooring contractor from San Diego who has put up with my rants for 35-40 kilometers. Earlier this year his prostate was removed – after 35 painful cobalt treatments at $5,000 per. It left him incontinent and, distraught, he delayed his Camino until it was under control. And then there’s Nora, a fit young Belgian who’s putting the pedal to the metal to reach the end point, Santiago de Compostela, in 25 days. That’s seven below the norm. And the same question has been asked of me. 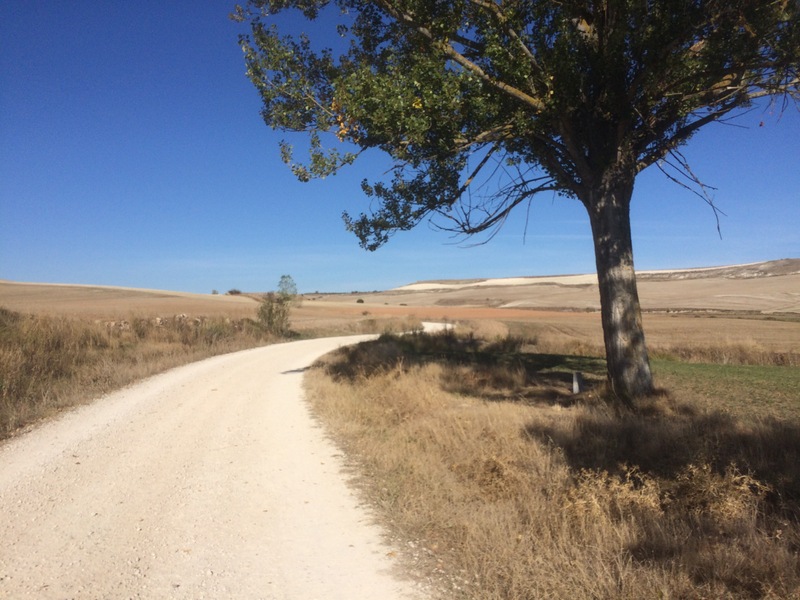 My answer is in flux: what began as a mere adventure is slowly becoming what Uta, Kirsty, Steve and the others learned well before me: what you think of the Camino and what it thinks of you are two entirely different things. My spiritual tilting aside, I am definitely in the minority. Perhaps I’ll move over to the other side in the next 23 days. I’m sitting in the common area of a 100 bunk albregue in Najera, Spain at 9:00 p.m. on a Saturday night. To my right are young Spaniards. To my left appear young Italians, one of whom has nursed a sore knee for several days and now he offers me potato chips, which I gladly accept since I crave the salt. Being around these young folk, in their 20s and 30s is energizing even though I don’t understand a word they’re saying. It’s just downright fun. Although the young Italian (I don’t know his name) has labored for at least three days, he’s in good spirits. On his right knee is a Coke bottle containing frozen agua. Even though we are dense on each other’s language, he points to the sore spot and continues his ice regiment. 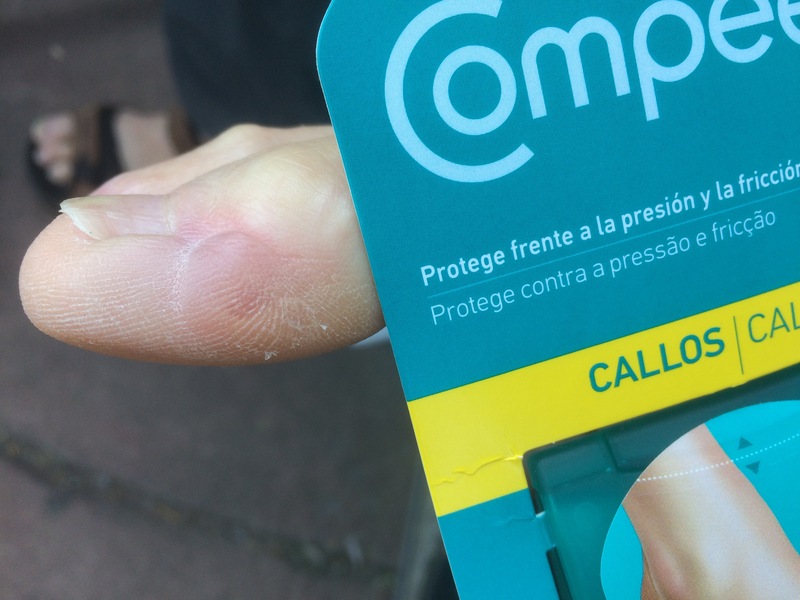 His is the tip of the injury iceberg – and we’re not one-third of the way through the Camino. There are many, many, many people with knee wraps, braces and compression bandages to manage various aches and pains. But it’s hiker feet that are in crisis. A guesstimate is at least one-in-four peregrinos sport bandages or mole skin or or braces or other remedies on toes, heels and other pain zones on their feet and legs. Yet they persevere. They push on. It’s these people I admire. They are, by and large, overwhelmingly positive about the 549 daunting kilograms they have left. 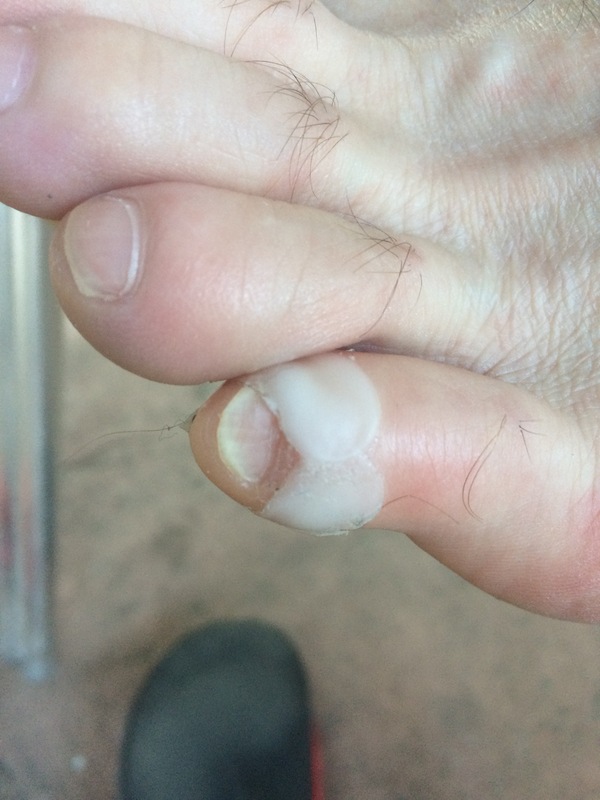 An Aussie laughs out loud when I photograph his horribly blistered heel. A Canadian couple doesn’t blink when I want to shoot their feet covered in duct tape. “It works wonders,” the husband says. Another woman balks at revealing her blood blister although the enlarged redness through her sandle is for all too see. Some seek, I think, a liquid remedy – and the comfort of other you folk. The term for pharmacy in Spanish is farmacia – duh – and they do a land office business as they prey on the medicinal needs of passing peregrinos. But my needs aren’t medicinal, per say. I merely ache. That viewable with Advil and Motrin. Even as I speak their triage efforts are in full swing. They hope for the miracle of medical engineering. Me, I hope a few glasses of vinto tinto are enough lubricant/pain allever to do the job. Snoring. So, you expect anything different in a room full of older adults? Earplugs are standard equipment. Deal with it. Sorta clean but creaky bunks. Deal with it II. You get what amounts to a paper mattress and pillow cover to ward off bed bugs. And when the peregrino above you rolls over (or passes gas), you feel and hear it. So just go back to sleep. Today’s 28km jaunt from was more of the same. Which is to say amazing, gorgeous and inspiring. Look down and you miss the ruins of an Iglesia to your right. Fumble with your water bottle and you miss a castle on your left. 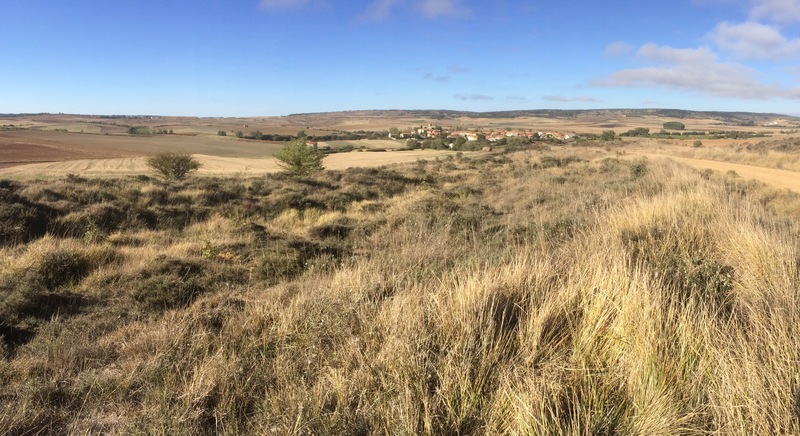 We cut through wheat fields, walked within feet of untold vineyards (after all we are in the arid wine region of Espana) and touched olive trees as we plodded mile after mile. Dragging me along in the predawn darkness was Paul, a 46-year-old from Boston. A great guy who was walking for a week then heading home to his job with Pfizer. Whereas I go unknowledgably with the flow, Paul is a reader and apparent historian. Why is this decrepit stone structure in the middle of that hill? “Oh, that looks like a hospital for pilgrims,” he said. That castle up on that ridge? “That was likely an outpost to fend off the Moors in the 14th century.” I learned of Barbary pirates enslaving Christian’s captured along the coast, and how European businessmen were reluctant to interfere with rampant warfare as long as trading lanes stayed open. I needed to be around a guy like Paul. Alas, we parted ways in one of the coolest medevil towns we’ve encountered, Viana. He wanted to learn more about a 13th century church. I wanted to buy pan and chocolate for lunch. That’s why he knows stuff and I merely walk along in wonderment. Already I’ve lost count of the languages overheard on the walk. There are the easy ones (at least to recognize): Spanish, French, German, Japanese. I’m a bit sketchy in the Slavic tongues but there are 26 more days of hoofing it to make acquaintance. Regardless of nationality, these peregrinos are an interesting bunch. They’re all trying to make it work, all trying to figure out where to stay, where to eat, how to put one foot in front of another. How to keep on keeping on. If they share one other commonality, it’s a stock response to perhaps the most benign of questions – ‘Are you going all the way to Santiago?’ And invariably their answer: “That’s the plan.” I’ve heard that who knows how many times, most recently from Larry, a jovial Canadian. I guess there is one other trait that is a dead giveaway of the weary walker. Everyone is sore. It’s a given no matter their pace. 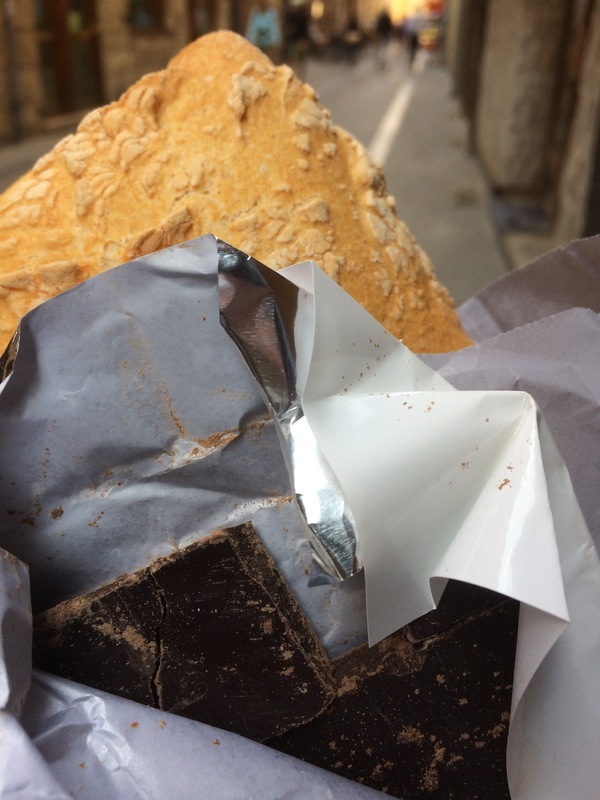 You can instantly spot an aching pilgrim especially after they shower and make their way – slowly – to the central plaza for the obligatory menu de peregrino (a fixed item meal for usually 10€) and something to ease their suffering. They are the ones who limp or shuffle along at a snail’s pace, sometimes with bandaged feet and toes visible through their sandals. They seem to feel they’ve earned their cerveza or vino tinto. Come to think of it, that’s what I’m doing right now. I share their pain.